A library database is a searchable, organized collection of electronic information. A database can contain any type of information, but for the most part, you will use a library database to search for articles and other research materials. Databases can cover a variety of topics or be subject specific (e.g., business, health). Library databases can be accessed off campus by logging in with your myPittCC username and password. Type search terms into the search box and click Go. Refine the results list by full-text availability, date, subject, type of resource, etc. View, print, e-mail, or save the results. Some databases focus on a specific subject area such as business, criminal justice, science, nursing, etc. To see a complete list of the databases that are available, click the Online Databases (A-Z List) link below. Once you have the Online Databases page open, click All Subjects button to see a drop-down list of subjects. Click a subject area to view a list of databases. 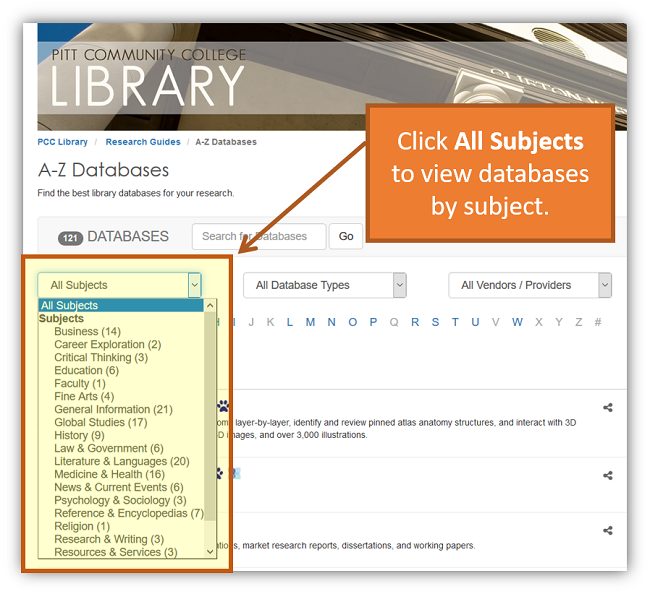 View a complete list of the databases provided by PCC Library. Do not use complete sentences when searching a library database. "death penalty" OR "capital punishment"